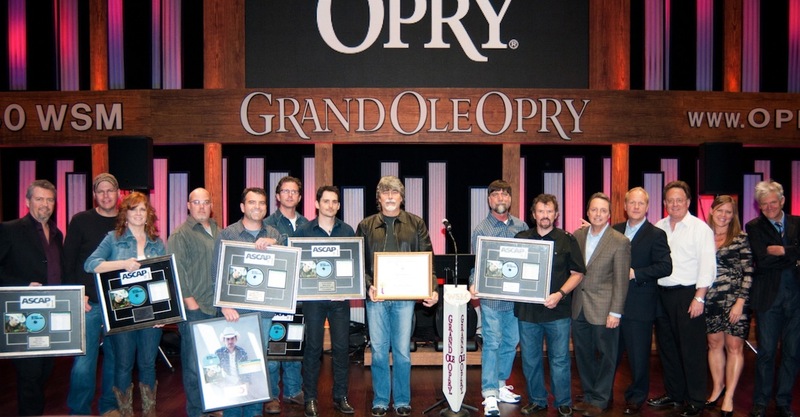 No setting could have been more ideal than the stage of Nashville’s Grand Ole Opry as ASCAP and BMI joined to honor the team behind Brad Paisley’s No. 1 hit, “Old Alabama,” featuring legendary country supergroup Alabama. Co-written by Paisley, Chris DuBois, Randy Owen and Dave Turnbull and published by Sea Gayle Music, Full Circle Music and Sony/ATV Publishing, the song spent two weeks at No. 1 earlier this year. “Old Alabama” is the reigning CMA Entertainer of the Year’s 19th chart topper, for which he and the band are nominated for two CMA Awards this year, including Musical Event. This also marks the very first time that the legendary Grand Old Opry stage has played host to a No. 1 party. Pictured (l-r) are Full Circle Music Publishing's Lynn Gann, Sea Gayle Music's Mike Owens and Liz O'Sullivan, ASCAP's Marc Driskill, co-writer Dave Turnbull, co-writer Chris DuBois, Brad Paisley, co-writer Randy Owen of Alabama, Alabama's Teddy Gentry and Jeff Cook, BMI's Jody Williams, Sony/ATV Publishing's Troy Tomlinson, Arista Nashville's Gary Overton, Lesly Tyson and Skip Bishop.